Live ewes can deliver live lambs, dead ones can’t .. so the first consideration is immune response and metabolic health over late pregnancy, including managing down the challenges of prolapse, milk fever and sleepy sickness. Beyond this our focus is birth speed (including how quickly the second lamb follows the first), and new-born vigour because combined these factors influence the maternal bond and the equitable provision of colostrum. Our mineral trace element and vitamin inputs given to ewes over late pregnancy are designed to produce lambs that will be very vigorous, to be better able to withstand cold, have immune competency and elevated trace element reserves. During the last third of the pregnancy, mineral and especially trace element demand increases due to the requirements of the developing foetus and in preparation for birth. The building of reserves via maternal-foetal transfer occurs in line with the lamb or calf’s development – especially its liver development, and for most elements this takes time. By providing ongoing supplementation during the last 6-8 weeks of pregnancy, not only do we offset any shortcomings in the winter diet, we also increase reserves of lambs at birth. FULLBLOOM and TUSSOCK FINEWOOL can be supplied in two formats – granular free access and blocks. The benefit of granular free access lick is that individuals get their “dose” and move away. This ensures all individuals get equal access - lower pecking order ewes can actually satisfy their requirements. Poorer animals have the opportunity to “correct” themselves and this is where we believe the gains in survival come from. Not surprisingly intakes vary according to number of lambs carried; triplets >>> twins > single bearing ewes. Blocks on the other hand, restrict intake and can be less effective due to pecking order problems. They may be the only option for extensive properties and/ or those who want less work (or can’t get through the mud!). Blocks also suit single bearing ewes. FROLIC Pre-tup & Pre-lamb (the original) and FROLIC NVD formulations (liquid formulation which includes vitamins A&E) deliver more than just iodine. The other ingredients positively influence maternal behaviour (how settled and attentive the ewe is), will to live and also the lamb’s sucking drive. New-born vigour is ultimately important. 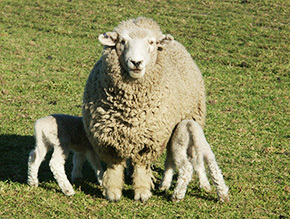 It is the basis for early colostrum intake and also for establishing a strong maternal bond (the mothering ability of the ewe is determined each season largely by how intense the lamb’s nudging/ suckling and bleating activity is). Vitamin A is indicated where there is a lack of green in the diet OR where nitrate levels are likely to be high (false spring and high fertility pastures). Vitamin E is indicated in high country situations and also when the winter diet contained silage or root crops. Pre-lamb vitamin inputs make sense for twin and triplet bearing ewes to ensure levels in colostrum are high enough to share. Pre-lamb drench with FROLIC NVD 10-15 days prior to lambing (bagging off / set stocking). This gives time for the iodine to be utilised but is within the time for a “drench” sized input of the other ingredients to impact lamb vigour and maternal behaviour. This product is a variant of FULL-BLOOM so in addition to being a trace element delivery system the design further emphasizes inputs that target metabolic homeostasis. FINAL APPROACH contains elevated levels of vitamins which also impact new-born vigour and colostrum quality. It is used at set stocking through to lambing and is also indicated starting several days after heavily pregnant ewes come off brassica crops.